Tonight I will have three beers made by Brouwerij Verhaeghe in Vichte, Belgium. Verhaeghe is a great example of a west Flanders brewery, producing a number of what they call red-brown ales as well as a kriek, a pils, a few amber ales, and a Christmas beer. Tonight I will have the three sours they make that I can readily get a hold of: Echt Kriekenbier, Vichtenaar, and Duchesse de Bourgogne. Astute readers may remember that the Duchesse was the first sour I rated on this blog, as well as note that it is now the first beer I have tasted twice. 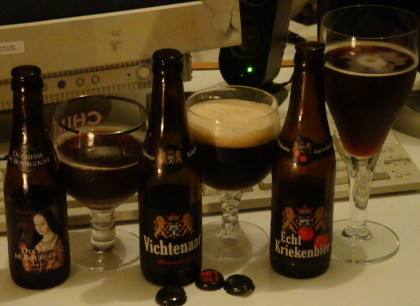 First up, the Echt Kriekenbier, which pours a ruby-tinted caramel amber with wisps of tan head. The nose has a delicate sweet and sour character. I notice cherries at first, then sweet malt and apple cider vinegar. A complex blend of wood, smoke, and blackberry jam makes this subtle aroma remarkably intriguing. The sublime cherry flavor begins on the lips before the beer even enters the mouth. The balancing tart accentuates the fruit. Rich acidic and caramel malt body, a bit cidery. The cherry is supported and enhanced all the way back, remaining prominent even in the tart aftertaste. A serious kriek. The Vichtenaar is an opalescent deep hazelnut brown with a thick and creamy tan head. It has a rich woody aroma with a strong vinegar character. The nose is also a little fruity (grapes or dates) and a little malty. Just a touch of bourbon. This beer tastes like a strong brown aged in a balsamic vinegar cask. Rich malty toast and caramel is complimented by major woody and flavors and a mild acetic sour. Creamy and mouth filling but lively and with a lingering tart. The Duchesse de Bourgogne is a lightly hazy dark ruby brown with a thin, long-lasting, layer of tan foam. A rich balsamic vinegar and acetic nose with significant fruit: raisins and dates but also kiwi and bubblegum. This beer has the thick aroma of an empty port barrel. The Duchesse is relatively balanced but leans heavily towards sour. Some complexity comes from a rich oak character and fruit: raspberries, blackberries, and raisins. A robust cider vinegar sour and caramel malt sweet hold on for a bit before yielding to a fruity tart that lingers for quite a while.